The bracing industry has been undergoing revolutionary advances in recent years with the emergence of new and innovative materials, as well as, engineering and scientific breakthroughs. Bracing designs have significantly improved with resultant lighter weight, more comfortable and better fitting devices. 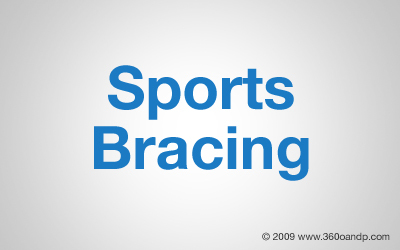 Basically, sports bracing can be divided into two types; preventative or prophylactic design and a functional approach. The preventative sports brace is basically a reminder to the athlete that there is an injury or an instability in a particular body area. The functional brace actually inhibits excessive motion. Of utmost importance is that any sports bracing must be carefully matched to the athlete, as well as the particular sporting activity undertaken. The physician, therapist and orthotist must consider all ramifications of the brace usage to properly assess the short and long term goals of the individual. Equally important and interesting are the myriad of adaptive devices for recreational activities for those individuals with disabilities. Water sports, wheelchair sports, tennis, bowling, basketball, road and track racing, boating, fishing, snow sports, horseback riding, etc. all are a vital part of the rehabilitation program for the disabled population.